10 RULES FOR WORLDSHAKING REVIVAL Are you ready for an outpouring of the Holy Spirit? TABLE OF CONTENTS FEATURES P . 1 0 TEN RULES FOR WORLD-SHAKING REVIVAL Gordon Lindsay explains how to prepare for a massive outpouring of the Holy Spirit. P . 1 4 AN ORPHAN NO LONGER Adopted CFNI student convinced of God's love by Divine appointments. P . 1 8 DARE TO BE A WARRIOR Jane Hamon challenges believers to use spiritual weapons to win supernatural victory. WHAT MAKES CFNI DIFFERENT? Dennis Lindsay explains how CFNI is able to transform thousands of lives. WHY SHOULD YOU TAKE A TOUR OF ISRAEL? Eleven reasons why you should visit the Holy Land. LA INFANCIA DE JESUS, ¿NORMAL O SOBRENATURAL? Jesus’ childhood used as an example of why children need Bible training (in Spanish). CFNI SCHOLARSHIP STUDENTS International students from Mexico, Brazil, Russia and India. CREATIVE MUSICAL DRAMA 10-YEAR REUNION Get reconnected with your CMD alumni. View our live stream and video archive. Subscribe for a $12 annual donation to receive The Voice magazine, plus free monthly audio sermons. cfnthevoice.com MEET THE VOICE CHRIST FOR THE NATIONS THE VOICE MAGAZINE EDITOR IN CHIEF Gordon Lindsay (1948-1973) Freda Lindsay (1973-2008) President and CEO, Dr. Dennis G. Lindsay CFNI Director of Alumni Relations and Vice Chair, Ginger Lindsay PRESIDENT’S COUNCIL Chairman, Board of Directors: Ed Bianchi Chief Operations Officer: Golan Lindsay International Ministries Director: Randy Delp CFNI Director: Dr. John Hollar Director of Operations: Michael McMenomy THE VOICE / ONLINE STAFF Marketing Director: Nina Joundi Managing Editor: Michelle Ofori-Ansah Project Managers: Pearl Jomalon and Carmen Lopez Editing: Linda Vasquez (Spanish) Designers: Yujin An, Karina Fernandez, Erick Medeiros, Rafael Pereira, Mari Satani and Renato Vieira Photographers: Zhanna Arbatskiy, Joshua Davis and Mari Satani Video Editors: Fabricio Montelo Lima and Nicodemo Sanchez Webmaster: Zhanna Arbatskiy Editorial Assistance by Polly Harder, Publishing Director Christ For The Nations THE VOICE Magazine is an interdenominational quarterly publication that seeks to encourage the unification of God’s people, especially in efforts of mass evangelism, by reporting remarkable testimonies of healing and deliverance, and promoting sound teaching, deep spirituality and humility. Christ For The Nations Inc., a nonprofit organization, publishes this magazine under the laws of Texas. The editorial offices are located at: 3404 Conway St., Dallas, Texas 75224. For advertising, email managingeditor@cfni.org. 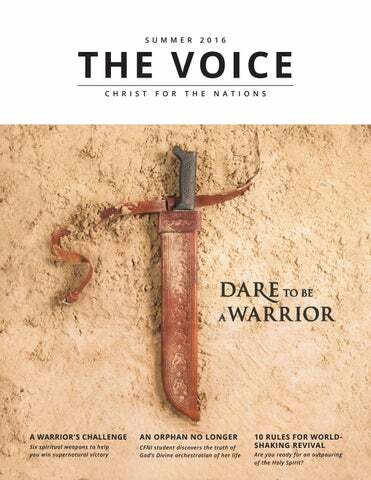 REPRINT POLICY: NOTHING APPEARING IN CHRIST FOR THE NATIONS THE VOICE MAGAZINE MAY BE REPRINTED WITHOUT PERMISSION. 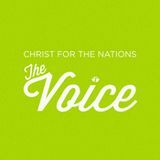 Christ For The Nations’ mission is to impact humanity with the gospel of Jesus Christ. Gain a vision for reaching the world with the gospel, deepen your relationship with Jesus and have fun at Christ For The Nations Institute! HOW WILL YOU RESPOND? n the first half of Isaiah 60:2, the prophet declares: “See, darkness covers the earth and thick darkness is over the peoples . . . ” The message of Isaiah resonates with our reality today. We seem to live in very dark times. People are worried, anxious and afraid. Natural disasters appear to be escalating with Ecuador and Japan being two recent examples of devastating earthquakes. The threat of Islamic terror is growing, but beyond these seemingly uncontrollable dangers, we also feel under attack from our own government. Age-old traditions have been defied, and rules have been upended (men in women’s restrooms? No problem!). So what do we do? CFN FOUNDATIONAL PILL ARS W H AT M A K E S C H R I S T F O R T H E N AT I O N S I N S T I T U T E D I F F E R E N T ? 2001 — The Advanced School of Children’s Ministry (now Children and Family Major) began with 12 students. America, and many denominational churches were experiencing the move of the Holy Spirit with signs and wonders. As a result, there were many people seeking more instruction on faith and the gifts of the Spirit. Dad began holding weeklong seminars with various full gospel ministers. It wasn’t long before the Holy Spirit led my dad to open a Bible Institute. CFNI provided training while emphasizing the Word of God and the gifts of the Spirit. 2001 — Spanish Youth For the Nations camp was launched. TRAINING—A FOUNDATIONAL PILLAR OF CFN Training believers is one of the 12 foundational pillars of Christ For The Nations. The following memo was written by Mom, who sent it to the director of CFNI over 30 years ago when we were only two years old. Notice that Mom points out the need to be a resident student. Although online classes are important, this memo speaks to the significance of residency and what is gained from a live-in environment. Christ For The Nations Institute is unique because it is not just about increasing the students' knowledge about God. Rather, it is about developing that intimate relationship with God. 2003 — The New Christian Conference Center was open. than 40,000 students being trained at Christ For The Nations Institute on the enlarged 82.5-acre Dallas campus with many thousands more graduates in the dozens of associated Christ For The Nations Bible school campuses that are spread around the world. MEMO FROM MOM—MARCH OF 1983: “The school began in order to offer a dimension of training that was not available elsewhere. It is a place of learning, but it is one where the emphasis is more upon the ways of the Spirit than upon techniques. The vision of Gordon Lindsay was to ‘study at a school where the most important subject is the student’s own spiritual life.’ CFNI is ‘practical’ rather than theoretical. Gordon Lindsay envisioned ‘a great center preparing young men and women to go forth with the message of the resurrection—that Christ is alive . . . life, power, victory, deliverance, ministry of the supernatural—that’s what we’re going to teach.’” This memo shows the vision of both my mom and dad, and emphasizes the role of practical training. As CFNI continues to grow and expand, we will remain true to the foundational principles of our founders, and CFNI will continue as a bastion of practical and spiritual training for world-changers. 2003 — Evening and Weekend Program was initiated. 2007 — Freda Lindsay World Missions Center was established. second year “leadership.” Each year we require students to take courses that we feel are necessary in providing their foundation. That has not changed. Today, these basic concepts are still in practice, along with a third-year program that was added in areas where students have a particular call on their lives and a desire to study one of the following: Biblical Counseling, C h i l d r e n a n d F a m i l y, C r e a t i v e Media, Evangelism, Global Missions, Marketplace Leadership, Pastoral, Worship and Youth. 2007 — 430 children attended the first Kids For the Nations Day Camp. 2008 — Preteen Impact Overnight Camp was launched. community environment that includes both singles and families — we must stress and encourage the completion of a three-year residency at CFNI. Our program is a total package. After pursuing full accreditation over a five year process, we completed the academic portion only to be led by the Holy Spirit to decline the official national recognition and remain “accredited” solely by the Holy Spirit. The word of the Lord came through our former Missions Director who explained that when he came to CFNI he was not seeking a transcript; rather he was seeking to be transformed. The CFN Board of Directors along with CFN’s in-house leaders unanimously voted to decline accreditation and remain as a Bible Institute, fully “accredited” by the Holy Spirit. CFNI is not an institute where one can earn a master ’s degree, rather it is a place where one seeks to fulfill the Master’s decree, “Go, and make disciples . . . ” What truly makes CFNI different from other Bible colleges? Transformation of the heart. 2008 — The Healing Place opened. Gordon Lindsay wrote this article almost 70 years ago, in November 1949, and it rings just as true today as it did then. Let’s connect with the legacy of our fathers in the faith, like Gordon Lindsay, and mix our prayers for revival with theirs. Then, stand back and see what God will do. Thousands will agree that we are now witnessing the beginning of the Heaven-sent revival, for which we have been praying a long time, and which, we have reasons to believe, may exceed that of the Early Church. We rejoice in this Divine visitation of the miraculous, but we are constrained to say that there are certain important circumstances which we must observe, if the Church is to receive the maximum benefit that God intends from it. For this revival to reach its full tide there is the most urgent need for leaders of humility. The eternal temptation is to build around one’s self. Even the apostles were not free from this delusion. We have record that they even commanded one to either join the apostolic company or to quit healing the sick, for which they got a rebuke from the Lord (Luke 9:49-50). Some have thought to secure a monopoly on the gifts of God and resented others praying for the sick. This is wrong. The ministry of deliverance has not been given for the purpose of building up human reputation, but to bring God’s healing grace to the sick and the suffering. 3 THE MINISTRY OF DELIVERANCE MUST BE RESTORED TO THE CHURCH Not all of God’s ministers are called to hold great healing campaigns. God is choosing a few to establish the Divine pattern, but all of us should carry it on. It is a weakness if the eyes of the people are allowed to center too much upon this or that leader. To go forward, the Church must carry on the Bible ministry of deliverance. This is an open door by which they can reach their community. EVANGELISTS SHOULD SEEK TO WORK WITH LOCAL PASTORS Revivals should be held in cooperation with local pastors. Pastors should by all means put forth an organized effort to follow up with the hundreds of converts who have come to Christ during revival campaigns. It is doubtful that all godly people shall see eye to eye in all things until the Lord comes. Contentions over minor matters of water baptism, predestination, eating of meats, holy days, novel prophetic views or subordinate doctrinal points are usually not edifying. Rather, they lend to dividing the Body of Christ, and obscuring the fundamental truths — salvation through the new birth, the Baptism of the Holy Spirit, deliverance from sin, sickness, fear and the oppression of Satan, and the soon return of Jesus Christ. Whenever God’s power is manifested, Satan will attempt to introduce excesses and fanaticism. There is a fanaticism of a faith not built upon the Word of God, and there is a fanaticism of unbelief. For example, some have laid hands on missionary recruits, promising that they should receive the ability to speak the language of the country where they would preach the Gospel. Although it is possible for God to do this, we find no scriptural basis for making missionaries in this way. There is a scriptural basis for the glorious truth that missionaries should fulfill the Great Commission in healing the sick and casting out devils. Great Gospel campaigns can be carried on only through liberal giving by the people. There may be times when this need must be made very plain. However, this can be greatly hindered if there is a continual auctioneering for money in the revival campaigns. There are some who are shortsighted enough to have destroyed their usefulness in the Kingdom of God by an offensive handling of finances. THIS REVIVAL MINISTRY INVOLVES A MISSIONARY VISION Many missionaries return from the mission fields broken in health and discouraged. Let us state that the ministry of deliverance is part of God’s answer to the need on the mission fields. We have been sending physical tools to help missionaries reach the remote areas. Now we must encourage them to receive the spiritual tools necessary to cast out devils and heal the sick. The Gospel must be backed up by more than words. Blind eyes must be opened, the deaf must hear and the lame must walk. Then the heathen will listen. Mankind has always hindered revivals by attempting to put everybody through the same “cookie-cutter.” God is a God of variety. Many are now receiving the Holy Spirit through the laying on of hands, but many have received the Holy Spirit without the laying on of hands. People may be healed listening to the Word. Some are healed through the use of anointing oil, some without oil. Some are healed through an instantaneous miracle, others gradually become well. Let us not attempt to “fence” God in, but work for the unity of the Body of Christ to knit together its members, rather than to divide. “My mother was only 13 years old when I was born,” Jordan shared. She was adopted on the eighth day of her life, a gift and a promise to her new parents. They named her Jordan, after the river that the Israelites had to cross to enter the Promise Land. Her name became a reminder of God’s faithfulness to His promises. Jordan, an African-American girl, grew up in a good Christian home in a Caucasian family in a small town in Louisiana. She was the only child, and her parents poured out all their aﬀection on her. Despite their unconditional love, she struggled with feelings of emptiness and rejection. She often asked herself, “Why did my mother give me up? Am I worthy to be loved? Do I belong here? After all, who am I?” She felt out of place, like a tiny piece of a giant puzzle that she couldn’t ﬁgure out. This was just the beginning. There was another Divine encounter waiting for Jordan at CFNI. Adam McCain, another CFNI teacher, spent time getting to know her. As he did, he realized that he had been the youth pastor in the church where her biological mother grew up. He remembered praying and speaking destiny over Jordan when she was still in her mother’s womb. The two were so amazed at how God had Divinely orchestrated their meeting, almost 20 years later, that they couldn’t hold back their tears. That moment God whispered to Jordan’s heart, “You are a promise from Me. And you will see all of My promises come to pass.” Suddenly, Jordan had a moment of clarity. Her life wasn’t an accident. Her conception, adoption and the family she grew up with were sovereignly ordained by God. IMPACT THE WORLD WITH CFNI SCHOLARSHIP STUDENTS Daniel Garcia, Mexico It was my dream to study here, and because of my scholarship, it became a reality. Through CFNI God has planted love in my heart for the nations and a desire to be a blessing to others. Hola Olá Fabricio Montelo Lima, Brazil At CFNI, I learned that I can build the Kingdom of God by being a godly influence in the marketplace. I want to use video production and graphic design to show people what the Lord is doing across the world and to bring them hope. I still remember my very first chapel at CFNI. I couldn’t hold back the tears. God used my time at CFNI to plant His Word in my heart and set me free from fear, giving me a passion to share Jesus with the world. Sarah George, India My father graduated from CFNI in 1973 through correspondence. He visited Freda Lindsay in 2001, and she offered scholarships to all of his children. I am in the Biblical Counseling Major, being trained and equipped to bring restoration to people’s lives. These scholarship students represent just a few of the many students whose biblical and spiritual education is funded by our partners and donors. You can impact the world by giving toward the CFNI scholarship fund. Change one student’s life and you can change a country. “And from the days of John the Baptist until now the Kingdom of Heaven suffers violence, and the violent take it by force,” (Matthew 11:12). Referencing this scripture at the annual Alignment Conference, hosted by Christ For The Nations Fellowship of Ministers and Churches, Jane Hamon, writer, pastor, prophet and a mighty intercessor, declared to the leaders gathered that “the days of casual, comfortable Christianity are done.” She challenged the audience to dare to be warriors and to engage in the battle over evil. All believers have at their disposal great and mighty spiritual weapons to forcefully and radically advance the Kingdom of God in order to dispel the growing darkness. Citing Psalm 149:6-9, Hamon says that as saints of the Lord, we are called upon to execute the written sentence of the Lord against Satan and his hosts, and enforce the victories of the Cross, in much the same way that a bailiff enforces the decree of “Guilty” from a judge. “Don’t be afraid to engage” she admonished. “If you are afraid, get training! Equip yourself in the Word, but also equip yourself in the Spirit.” For the Christian seeking to push back darkness, Hamon described six weapons of spiritual warfare: prayer, praise, proclamations and decrees, prophecy, peace, and prosperity. WEAPON OF PRAYER In emphasizing the need for prayer, Hamon quoted World War II General George Patton who said, “Those who pray do more for this world than those who fight. If the world goes from bad to worse it is because there are more battles than there are prayers.” Prayer brings the capacity to turn things around, to bring radical transformation into a territory and a community, and the more the Church prays, the brighter the light that shines over the world. Hamon declared that one of the most powerful things a Christian can do is to pray in tongues. It is one way in which a believer can pray effectual, fervent prayers as admonished in James 5:8. WEAPON OF PRAISE Praise may seem to some to be an empty spiritual exercise, but according to Hamon, it is a mighty spiritual weapon. Isaiah 30:31-32 captures the power of praise succinctly “…Every stroke the LORD lays on them with His punishing club will be to the music of timbrels and harps, as He fights them in battle with the blows of His arm.“ Hamon excitedly declared, “God is a mighty man of war, fighting with the weapon of praise!” As children of God, we have this weapon at our disposal, and we have to learn to use it as well. If you have ever been depressed, down, tired or just discouraged, and felt a great release in an atmosphere of praise and worship that is the weapon of praise in action and not just the psychological effect of the music. WEAPON OF PROSPERITY The enemy loves to lockup wealth. Hamon shared Ecclesiastes 9:14-16 as the reason prosperity is a weapon. In this passage, the wisdom of the poor man is despised, even though it resulted in breakthrough for an entire community. Hamon declared, “God wants you to use wealth as an influencer to help shift some things. The spirit of poverty loves to get a hold of territories and partner with a spirit of witchcraft.” She shared a powerful story to illustrate this. One of their ministers was at a traffic light in front of a palm reader’s shop, praying for the business to be closed, and God gave her specific instructions on how to pray. “Pray that the money that is keeping her in business dries up.” So Sharon did, and instantly (this was all within the span of a traffic light) the front door flew open, and a woman with a long robe and turban on her head, the palm reader, came running out onto the front porch and screamed, “NOOOOO.” Hamon said, “Within three months, her business was shut down, and it had been there decades!” This is the power of prosperity when it is in the right or wrong hands. CONCLUSION Hamon ended by describing the necessity for the Church to use spiritual weapons to do what Jesus prayed in Luke 11:1-4. “What did Jesus mean when He prayed, ‘Thy kingdom come and Thy will be done on earth as it is in heaven?’ He was saying for us to superimpose Heaven on Earth so that Earth would begin to look like Heaven. It’s time to get out of survival mode and start advancing the Kingdom of God. First John 3:8 says, ‘For this purpose the Son of God was manifested that He might destroy the works of the devil!’” If destroying the work of the enemy was Jesus’ main purpose, shouldn’t that also be the aim of the Church? It’s time to dare to be a warrior. When it comes to the subject of Israel, this is possibly the most asked question among Christians: “Why should I go to Israel?” There are so many reasons that could be listed, but here are just a few. Without the Jewish people and Judaism we would have no Savior in Jesus Christ and no Christian faith. It’s a bit overwhelming how many Gentile Christians have no real sense of the history of their Christian Faith. A trip to Israel can immediately rid any Christian of this unfortunate ignorance. The Apostle Paul refers to Abraham as the spiritual father of all Christians. What more inspirational thing can you do but visit the land of our spiritual foundation and our spiritual father? Contrary to popular secular mentality, the most important place on earth is not New York, Los Angeles, London or Paris; it is Jerusalem and the Jewish nation of Israel. The scriptures are very clear as to God’s position to and priority for Israel. The Jewish people are God’s chosen people. Anything God has ever done in covenant history with His people, in both the Old and New Testament, has taken place in and around the nation of Israel. The land of Israel is God’s chosen property and nation. God will bless those who bless Israel. The city of Jerusalem is “the city of God” and “where God has put His name.” It is the birthplace of our Lord and Savior Jesus Christ. It is the place where Jesus lived and did all His ministry. It is the place Jesus promises to return. For these reasons and even more, why wouldn’t any Christian that loves God and understands what God has done for them visit the place of their own spiritual heritage? PreparE for your calling With flexible class times, specific scholarships just for you, and a chance to complete your bachelorâ&#x20AC;&#x2122;s degree in less than 18 months, pursue your calling at a Christ-centered, fully accredited university. Continue HERE what you started THERE. The world is waiting. Coffee Nights on CNFI’s campus, and college students from surrounding colleges would drive in for their clean comedy routines. In 1995, CMD started emphasizing an evangelistic focus, as they began yearly outreaches. Their first trip was to Jamaica, and they saw over 300 people come to the Lord! CMD members ended up sharing the Gospel, using their creative approaches, in more than 22 nations over the next 11 years. In the years since CMD was an active ministry, CFNI continued to use drama in various forms, with current outreaches using it to minister around the world. CMD’s former members have gone on to pursue God’s calling and purpose, here in the U.S. and in other countries around the world. But this year, CFNI is calling all CMD alumni to return to campus for a reunion. It’s been 10 years since the last CMD class and student ministry, and we want you to come back to celebrate this unique and influential ministry. The CMD reunion will be held on the CFNI campus, July 29-31, 2016, emphasizing fun and fellowship. If you took any CMD classes or participated in its student ministry or summer outreaches, you don’t want to miss this opportunity to reconnect with friends, share your memories and get fired up with fresh vision for taking the Gospel to the world in creative ways. Bring your family as there will be special breakout sessions for parents and children. Come and celebrate with us! Families welcomeâ&#x20AC;&#x201D;Special sessions will be held for parents and children. El historiador judío Flavio Josefo hace referencia a los principios pedagógicos que eran enseñados en Israel: “Los judíos aprendieron las leyes de tal manera como para que se hallasen grabadas sólo en el alma.” De su lado, el autor Rabí Natán hizo otra declaración al respecto: “Si uno estudia la Torah durante su juventud, las palabras de la Torah son retenidas en su sangre y proceden con claridad de su boca.” El apóstol Pablo nos confirma la veracidad de este principio cuando le recuerda a Timoteo: “… Desde la niñez has sabido Las Sagradas Escrituras.” Por esta razón, deducimos que los padres de Jesús tenían bien en claro su responsabilidad de instruirlo, como expresa Proverbios 22:6: “Instruye al niño en su camino y aún cuando fuere viejo no se apartará de él.” Algunas fuentes cuentan que los niños empezaban a estudiar la palabra de Dios desde la cuna, pues al parecer los padres tomaban al pie de la letra la porción de la Torah que ordena: “Y las enseñarás a vuestros hijos, hablando de ellas cuando te sientes en tu casa, cuando andes por el camino, cuando te acuestes y cuando te levantes” (Deuteronomio 11:19). o A los cinco años, todo judío conocería el alfabeto hebreo, a través del aprendizaje del Salmo 119. o A los 10 años, aprendería el Mishna (la ley oral). o A los 15, estudiaría el Talmud. o A los 20 años, se casaría. o A los 40 años, tendría madurez de razonamiento. o A los 60 años, iniciaría la vejez. o A los 80 años, edad avanzada. o Desde los cinco años, el niño conocería la lectura del Tenaj (la Ley, los Salmos y los Profetas). o A los 13 años, se consagraría como adulto en el bar Mitzva. o A los 18 años, aprendería una profesión. o A los 30 años, tendría completo vigor (la edad en que Jesús empezó su ministerio). o A los 50 años, sería consejero. o A los 70 años, edad canosa. Todo esto nos puede ayudar a concluir que Jesús, así como tú y yo, fue enseñado y educado; tenía que asistir a la escuela, obedecer a sus padres y cumplir con responsabilidades, pues las Escrituras resaltan que en todo momento estuvo sujeto a sus padres (Lucas 2:51). Así que Padres, tenemos un gran compromiso para que nuestros hijos crezcan en sabiduría divina. Es necesario enseñarles los principios de Dios en todo momento, tal como instruye la Biblia. ¡Hagamos crecer a nuestros hijos con la sabiduría de la Palabra! Y ustedes, hijos, no desprecien las enseñanzas de sus padres ni la dirección de sus madres, porque adorno de gracia serán a sus cabezas, y collares a sus cuellos (Proverbios 1:8-9). Hugo Martínez es el Director del Programa en Español de Cristo para las Naciones, en la ciudad de Dallas, Texas, donde además se desempeña como instructor. Todo esto lo hace con una gran pasión enfocada en entrenar y capacitar a esta generación a la que Dios lo ha llamado a servir. o A los 90 años, inclinado.